Saffron rice can be sweet and can be made with chicken, beef or lamb. It is a Hyderabadi dish, and it carries a lot of flavors, it’s pronounced as Zafrani Pulao. The cooking process is easy but what takes time is waiting for the meat to cook. If you are using chicken the cooking time will be shorter! What do you need to make zafrani pulao or saffron rice? Saffron is a must in this dish otherwise it won’t be a zafrani Pulao, and if you are using high-quality saffron you won’t need to use much, in fact for this recipe you only need 6 threads of saffron, however, if the saffron quality is low, then you will miss its flavor and color. 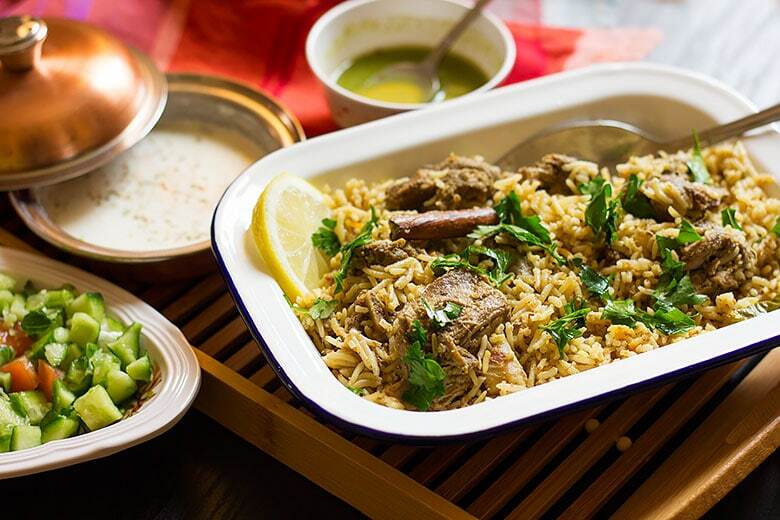 To make zafrani pulao, you will need your favorite type of meat, although for this dish lamb/mutton is best since it has a lot of flavors and cook faster than beef. You will need lemon juice, not much just a teaspoon. 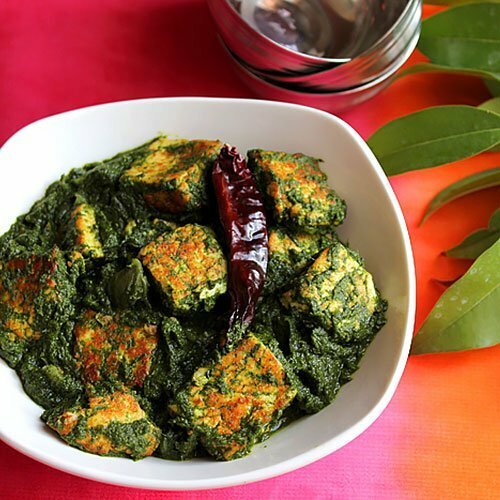 The lemon juice helps in keeping the rice fluffy and doesn’t let it stick while cooking. I have used basmati rice in this recipe; short-grain rice releases a lot of starch, and it’s not that you can’t use it, but it will not come out as fluffy as long grain rice. Next, we have yogurt; it will make the meat more tender and add a little more flavor to the rice. Garlic and ginger are a must, and even if you don’t like ginger and think that it’s too loud, in zafrani pulao, you can’t skip it. 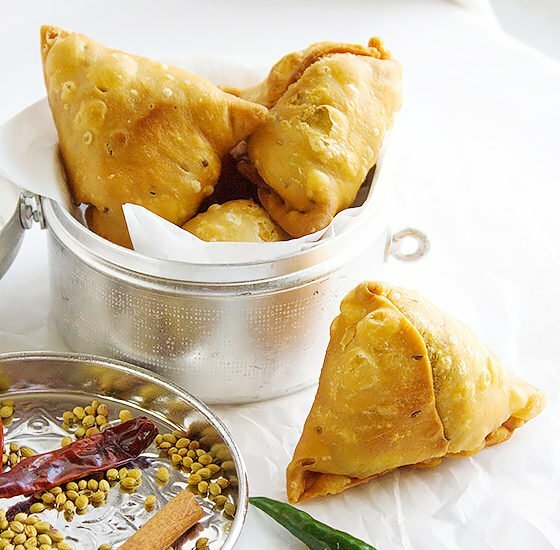 It plays a great role in bringing out different flavors. 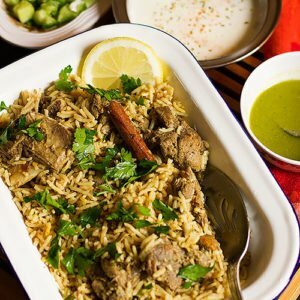 How to make zafrani pulao? 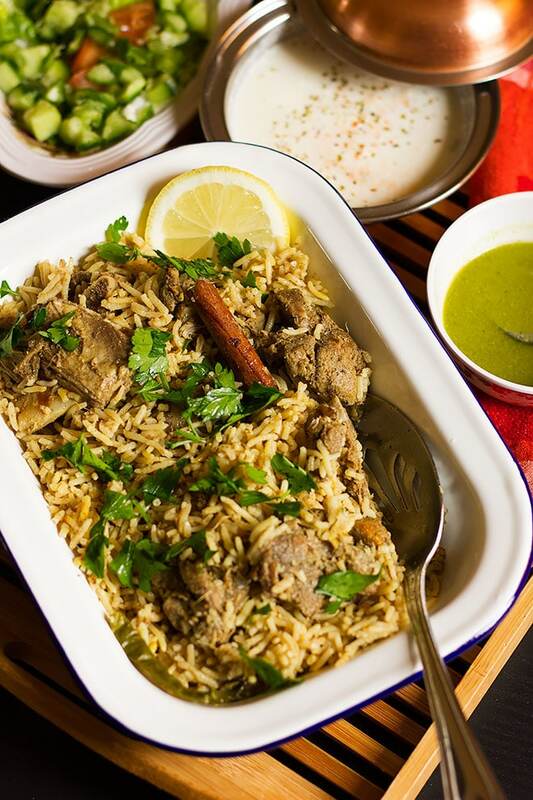 There are three steps in making zafrani pulao, the first is marinating the meat, the second is cooking the meat with its marinade, and the third step is making kind of a stew to cook the rice. 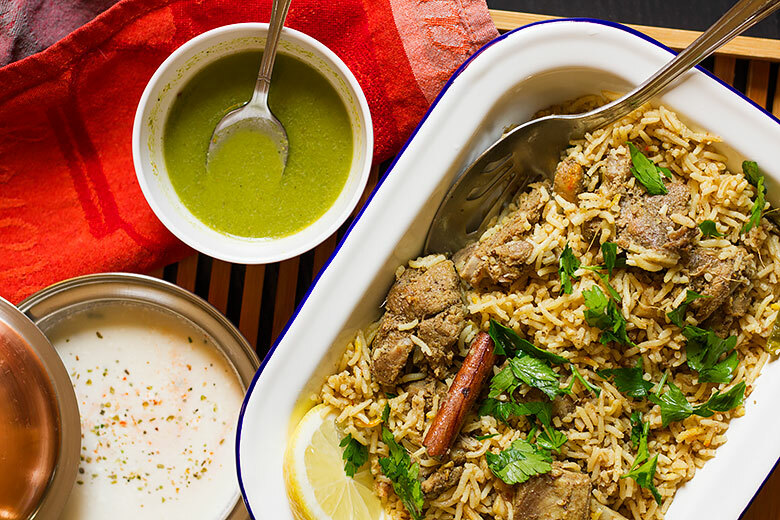 Zafrani pulao is so flavorful that you can enjoy having the rice without the meat. First, you must marinate the beef or mutton with all the marinade spices and keep it aside for 30 minutes, but it’s best to keep it aside for an hour. In a pan, add the oil and the mutton/beef with all the marinade. Cook until the meat is tender. In a different pan add the oil and fry the onion until light brown then adds the spices, yogurt, and green chili, cook for few minutes on low heat to prevent it from burning. Add the water, add the previously soaked rice, the lemon juice, and the saffron with milk when it comes to a boil. Cover the pan and cook on low heat for at least fifteen minutes. As you can see the steps are easy but cooking the meat might take a long time. I have bought fresh meat and used shoulder and leg cuts, these two have more flavors, and I kept the bones while cooking. There is another version of saffron rice, and it is sweet and a mouth-watering dish, it is made of rice, sweet spices like cinnamon, and to the sweet saffron rice, milk and sugar is added beside some dry fruits. 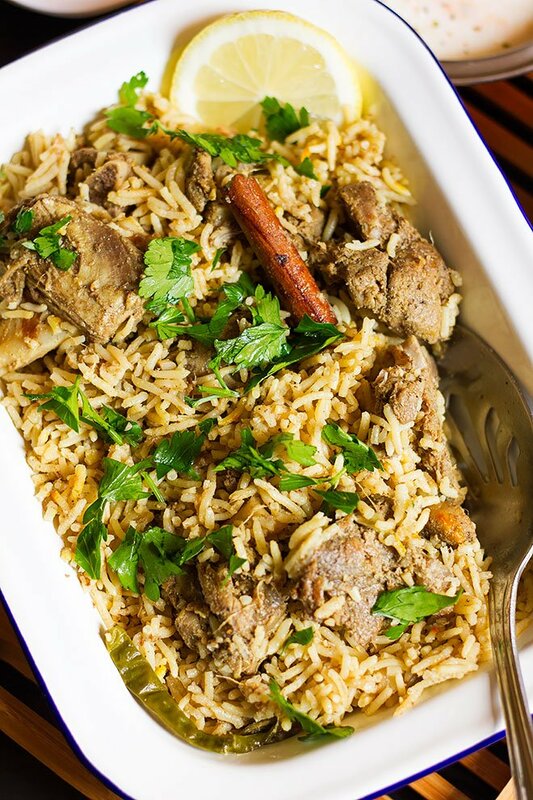 Another Pulao you will love to make! Saffron Rice or in Hindi it is called Zafrani Pulao. Tender and juicy lamb or beef with aromatic long grain rice. Mix all ingredients together and let it rest for 30 minutes to an hour in the fridge. Add three cups of water to the lamb or beef and let it boil until beef is cooked. and onion, fry until the onions are light brown. milk mixture and the lemon juice, stir gently. Cover the pan and cook on lowest heat for 15 to 20 minutes. This post was originally posted in 2010 and now updated with new images and text. Look delicious, i really would like to try it sometime. I’ve made it and it’s exactly as it looks in the image, plus a delicious taste. Great detailed and simplified steps. The spices you’ve used are making my mouth water! What a delicious dish!